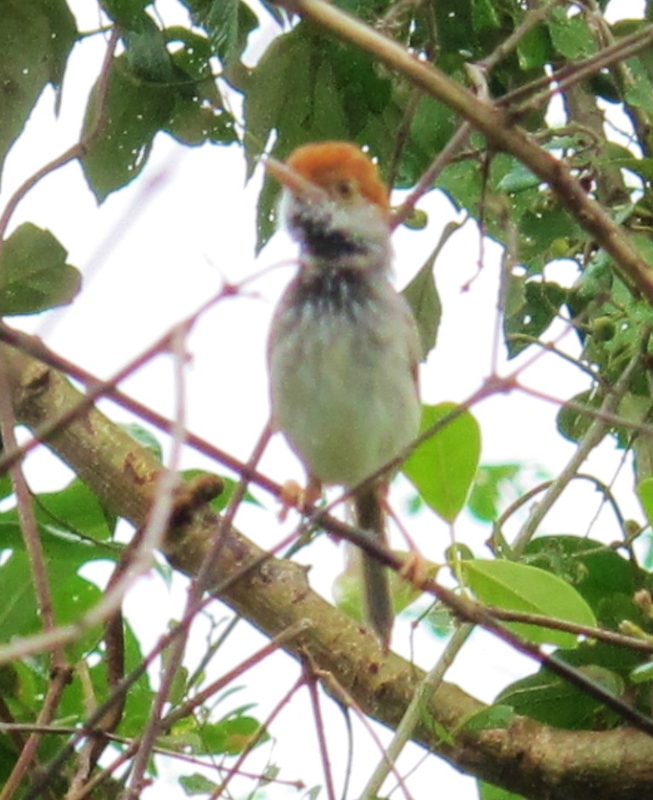 Cambodian Tailorbird, record shot taken with a Canon G12 in poor light and rain, September 16th 2015. Even in densely populated Asia, birds new to science are occasionally discovered – usually as a result of scientific surveys of very remote or previously inaccessible areas. Therefore, more than a few eyebrows were raised in mid 2013 when news was released of a previously undescribed species of Tailorbird. This bird was found living not in some remote forest, but literally under the noses of millions of people in Cambodia’s capital city, Phnom Penh. 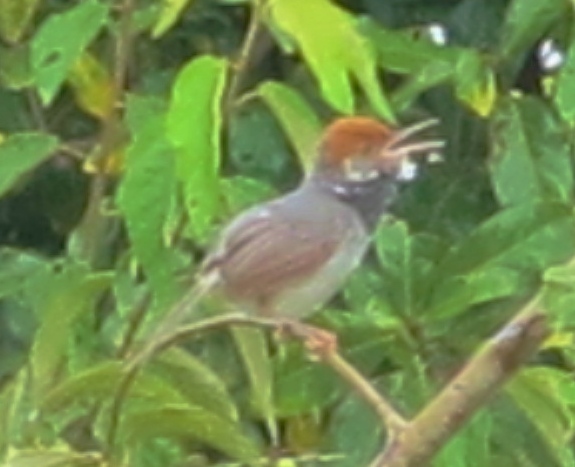 The Cambodian Tailorbird somewhat resembles a cross between Ashy Tailorbird and Dark-necked Tailorbird, being mainly grey in color like the former species, but with a large dark patch on its throat reminiscent of the latter. It also has distinctive vocalisations. It has so far been found only in riverine scrub in the flood plain of the Mekong, Tonle Sap and Bassac rivers, meaning its range is extremely small, and its population likely threatened by habitat loss from urban development. The site I had been given for Cambodian Tailorbird is about 15km north of Phnom Penh. From the city, follow Highway 5 towards Battambang along the west bank of the Tonle Sap river, as far as the Prek Phnov bridge. This crossing is also known as Ly Yongphat street, which is the name my tuk-tuk driver was familiar with. Immediately after crossing this toll bridge, there is a dirt road on the right (heading south). After about 1km, look for an obvious patch of dense scrub on the left, at approximately N 11 39 14.8 E 104 52 40.3. A little call playback here quickly enticed a pair of Cambodian Tailorbirds out into the open. They are probably common in all suitable scrub patches in the area, and certainly seemed extremely responsive to call playback. Unfortunately, it was raining fairly steadily at the time, and a couple of record shots with my Canon G12 were all I could manage in poor light. So all in all, a successful and rather easy “twitch” of a smart little bird. Coming from central Phnom Penh, allow 2-3 hours for the trip depending on how long you want to spend at the site (the drive itself takes about 45 minutes each way), and reckon on paying your tuk-tuk driver around $15-20 including waiting time. Lifer: Cambodian Tailorbird (total 1,988).